A Carim knight will dedicate an entire career to attending a single maiden, just as Morne once served one goddess alone. Eygon is initially found in Undead Settlement sitting in front of a cave right near the tower leading to the Road of Sacrifices. He guards a woman named Irina of Carim. Upon freeing Irina from her cell, Eygon will relocate to the Firelink Shrine. If you choose to kill Irina of Carim, Eygon will become hostile. If you buy any dark miracle from Irina, Eygon will no longer be summonable for boss fights, and will be hostile next time you find him (near Irina, by the door behind the Iudex Gundyr bonfire). His summon sign is available before the Crystal Sage fight behind one of the pillars in the room before the clearing. 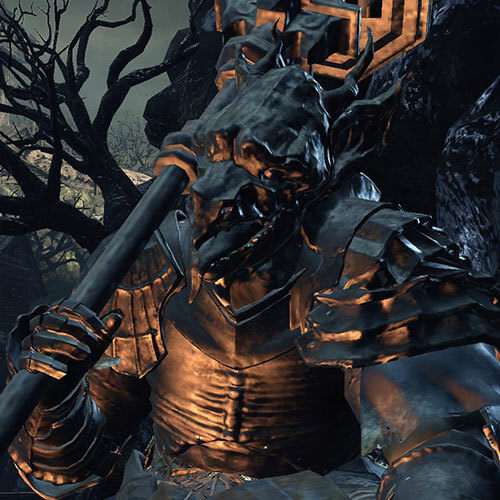 If you have already defeated the Abyss Watchers, he will be unavailable, because he will be in Firelink Shrine. If you want to summon him for the Crystal Sage fight, you will need to talk to him in Firelink Shrine, leave the area then come back, so that when the area reloads, he will have left. After that, he will be available again for the Crystal Sage fight. His summon sign is available before the Dragonslayer Armor fight in a room with an elevator to your right when facing the steps up to the Dragonslayer Armor boss fog. Hmm… Another one of those Unkindled, are you? All you faceless Undead, behaving as if you deserve respect. Hmph. No matter. Heed my words. If you've any sense, you'll go find a coffin to huddle up inside. You here, in this land of Hollows, you're like a frail maiden on the front lines. Then go on ahead, traipse right past the abandoned church. You'll face death, and it won't be pretty. Enough death to leave you broken, time after time. Then go on ahead, traipse right past the abandoned chruch. Hopeless, the whole lot of you. Like little moths, flittering toward a flame. You like poking around in cells, do you? Ah-hah, taken an interest in her, have you? Well, she's a lost cause. Couldn't even become a Fire Keeper. After I brought her all this way, and got her all ready. She's beyond repair, I tell you. The woman's a lost cause. Couldn't even become a Fire Keeper. You've gone and rescued her, have you? How very quaint, pitying creatures that are beyond help. Very well. I'm sick of looking after her at any rate. I am Eygon, a knight of Carim. I am allied to you as long as you assure the girl's safety. What's the matter? My terms are very simple..
Ahh, I know you. Been some time. I just dropped in to see how she's getting on. Now, what are you playing at with this circus? This cesspool of doddering oldfolk and degenerates. Couldn't be better. She must fit in perfectly here. This place is a cesspool of doddering oldfolk and degenerates. Couldn't hope for better. She must fit in perfectly here. I made myself very clear. My allegiance remained only as long as you assured the girl's safety. This knight of Carim does not forgive betrayal.